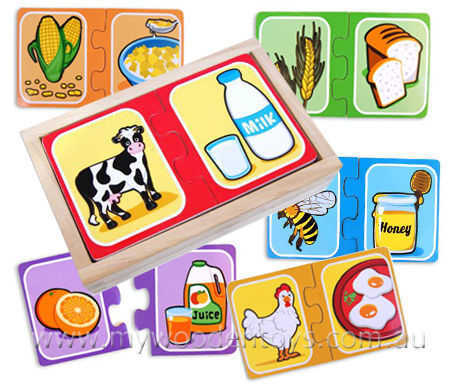 Make A Pair Wooden Puzzle is a simple little matching puzzle game with twelve pieces. Each piece matches with one of the same colour and the two pieces are related to each other. This puzzle comes in a sturdy box and each piece has the name of the picture on its back. Simple bright clear pictures make this a great learning tool. The relationships between the pictures show where things come from. Bees to honey, oranges to orange juice etc. We like this because: "Simple with lovely pictures."